For years, Sebastian Vettel has been not only Formula One’s top driver but its greatest prima donna. After his treatment of former teammate Mark Webber, it has been particularly satisfying to see him reduced to just another Sunday driver this season. Vettel shed little light on his woes. “How do I escape from this? I don’t have a boat here, but I’ll try to get home as quickly as I can.” Maybe it’s time to stop sniffing the fuel, mate. Coming into Monaco, Lewis Hamilton had assumed Vettel’s mantle at the top of the drivers’ championship. Turns out he’s stepped into Vettel’s diva boots as well. Hamilton got his knickers in a twist on Saturday when teammate Nico Rosberg seemingly robbed him of the chance to secure pole position. Rosberg, already in the lead, lost control on the final lap of qualifying, prompting orders for all drivers to slow down just as Hamilton was hitting top gear. 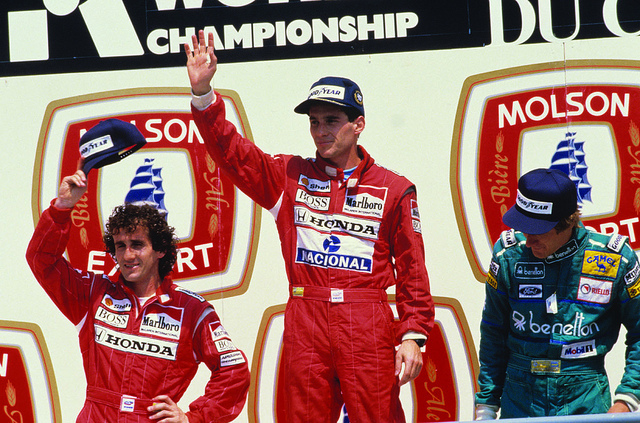 Teammates Ayrton Senna and Alain Prost hated each other’s guts. Hamilton was spewing. “I quite like the way Senna dealt with it, so I’m going to take a page out of his book,” he said, basically threatening to run Rosberg off the track the way Ayrton Senna did to teammate Alain Prost in the 1990 Japan Grand Prix. I was hoping they’d take each other out of the race, paving the way for Aussie Daniel Ricciardo to take the win. But Rosberg wisely wasn’t taking any chances. He stayed well out of harm’s way, forcing Hamilton to look at his rear end for 78 laps on a course where overtaking is a near impossibility. In his calls over the team radio, Hamilton got increasingly paranoid, berating the crew over pit stops, before bizarrely announcing late in the race: “I can’t see anything out of my left eye. I’ve got dirt in my eye.” It was hard to escape the biblical parallels. Hamilton drove on half-blind, Daniel Ricciardo breathing down his neck while Rosberg streaked away for a comfortable win. He must still have been unable to see when the three of them took the podium, otherwise I’m sure he would have shaken hands with his teammate and congratulated him on his win. As Rosberg waved his oddly shaped trophy, Hamilton looked like he wanted to insert his into his teammate. So Rosberg takes Hamilton’s lead in the drivers’ championship and another delicious Formula One feud begins. Next time, Lewis might not leave it to the last lap of qualifying to pull his finger out. He might also take the time to read up on one of the greats of his sport, Jack Brabham, who left us last week. Jack would never have been the big sooky la-la Lewis Hamilton was over the weekend. Previous Post Please, please, can we ditch the podium kiss? I love how you can identify who the sooky la-la is amongst the traditional testosterone tribe of racing car drivers! Ha! Lewis’ tanty was epic – he chucked all his toys out of the pram. Made Vettel look like a grown up!